Margaret “Marge” Barkman was honored with the first Distinguished Service Award ever given by the MSU Department of Communication. 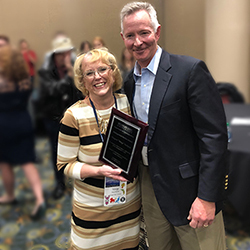 The award ceremony occurred in Salt Lake City on November 9, 2018, during the Department Reception at the annual conference of the National Communication Association. Kevin Kryston, a current doctoral student, and Monique Turner, former PhD student and a professor at George Washington University, and Frank Boster, a distinguished professor at MSU, each made statements about Barkman and the outsized role and impact that she has had over her 33 years in the Department. The speakers in particular noted the care and personal attention to graduate students that Marge has consistently exhibited. Barkman won the MSU Clerical-Technical Award in 2006, and is responsible for scheduling and graduate program affairs.